But I also read “Car Guys vs. Bean Counters” by Bob Lutz, who knows more about the automobile business than anyone alive… and who proudly declares himself to be the father of the Chevy Volt. And I read his defenses of the Volt against right-wing smears here and here and here. And I saw that the Volt (under its European badging as the Opel Ampera) just won European Car of the Year… the first American car ever to do so. And, as an engineer, I like the idea of plug-in hybrids. As I’ve stated elsewhere on this blog, I don’t think pure electric vehicles make sense for most people. Not now. Maybe not ever. But plug-in hybrids eliminate “range anxiety” while letting you run 100% electric for short trips around town. So I was rooting for this awkward underdog of a car, but wasn’t really involved. But, through an odd series of circumstances, we found ourselves with a Chevy Volt as a loaner car last week while Cissa’s car was being repaired. From the outside, the Volt looks a lot like the Chevrolet Cruze. There’s less of a family resemblance in the interior, but the American-designed Volt inherits the Cruze’s headroom and legroom. I’m 6’4″, and I’m completely comfortable sitting in it; I can even cross my legs in the passenger seat. By comparison, I cannot sit in a Prius, even a Prius V, for any length of time… my head pushes against the roof, and my knees are up against the dashboard. The Volt dashboard is a bit overwhelming at first. There are two iPad-sized screens; one in front of the driver, and one in the middle stack. Even though the middle one is touch-sensitive, it perches atop 38 hardware buttons (maybe to avoid comparison with BMW’s much-reviled iDrive). It all takes a little getting used to. Knowing that normal humans are not going to read a 424-page owner’s manual (plus a 108-page navigation supplement), Chevy thoughtfully tucks a 16-page summary into the glove box. You should read that; you’ll learn some things. 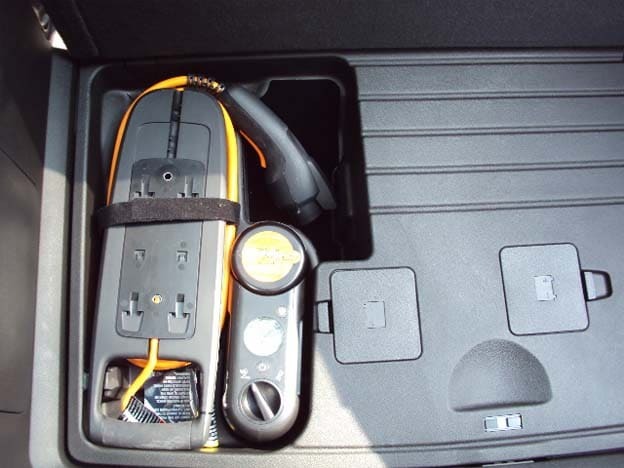 The Volt comes with wireless keys and pushbutton start, which I personally think is a solution in search of a problem, but all the cool kids are doing it, so…. But when you punch the big blue button, the dashboard breaks out into a kaleidoscope of images, the stereo makes a Star Trek “powering up” sound… and then SILENCE. The car is ready to drive, but the engine hasn’t started. And, unlike the Prius, where the engine starts by the time you’ve merged into traffic, the Volt’s engine won’t start for 30 or 40 miles. Separately, the Volt is the first mass-produced plug-in hybrid. That means exactly what it sounds like: you can plug it into the wall socket to charge the batteries. A Prius gets all its power from burning gasoline in its own engine; it just does so more efficiently than many other vehicles of similar size and weight. The Chevy Volt can do that too, but it can also get power from your local utility… meaning you don’t spend money on gasoline. In our first week of driving the Volt, we travelled 221 miles and burned half a gallon of gasoline. Of course, we had to pay for electricity. But Georgia Power can generate electricity a lot cheaper than your Prius can. In fact, you can sign up for a time-of-day pricing plan where you pay 1.25¢ per kilowatt-hour. “Your mileage will vary” but the Volt gets about 5 miles per kWh, meaning you’re paying Georgia Power 0.25¢/mile. (Read that carefully. Not 25 cents per mile. A quarter of a cent per mile.) Looked at another way, ten cents of electricity at cheap overnight rates will run your Volt for 40 miles. At today’s prices, ten cents of gasoline will run your comparably-sized 36-mpg Chevrolet Cruze about one mile. 40:1 ratios get my attention. So why aren’t we all driving electric cars? Because we still don’t have decent batteries, even after billions (and billions and billions) of dollars of R&D. The very best pure-electric cars have only 100-mile range, even under optimum conditions. And when your battery is dead, your car is dead. And it’s dead for a long time. You can’t just hitch a ride to the corner gas station and trot back with a five-gallon jug. You’re in for a close encounter with a tow truck, then a long charging period at the nearest charging station, wherever that may be. Which is why pure-electrics like the Nissan Leaf, the Tesla Roadster, and others are just oddities. Range anxiety. Back to the Volt: in one of those unsung-but-painful behind-the-scenes advances, most major electric vehicle manufacturers (including BMW, Chrysler, Ford, GM, Honda, Mitsubishi, Nissan, Renault, Tesla, and Toyota) have signed onto the SAE J1772-2009 standard, meaning you can have a single cable that fits into every one of those cars. Imagine if public charging stations had to have GM plugs and Toyota plugs and Tesla plugs, and… ouch. The Volt even puts a nice LED flashlight into their plug so you can easily connect the cable in the dark. One of those nice touches which convinced me that a bunch of smart engineers in Detroit finally got the chance to build a car the right way, not just the cheap way. Unfortunately, you can’t enjoy this silence with the windows down. Anywhere above neighborhood speeds, lowering a window creates a weird fluttering pressure variation that makes you feel like a helicopter is hovering overhead. I guess that, after all those wind tunnel studies, it was a tradeoff that GM decided was worth making. Disappoints me, but I’m a fresh-air fiend in my car. And you certainly can’t enjoy the silence with the sunroof open… because there is no sunroof. This is my biggest complaint about the car, actually. I guess the mileage zealots decided that having a sunroof open would play hell with fuel efficiency… but couldn’t they have put in an immobile glass panel? (With a sunshade, of course.) Wouldn’t have weighed more, wouldn’t have affected aerodynamic drag at all, and would have made the interior seem much airier. Two model years after introduction, Chevy shows no interest in a sunroof. Maybe they’re still planning to pave the roof with solar cells, but I haven’t seen that, either. Sigh. The center stack system demonstrates a lot of development effort. The touchscreen navigation and climate control are far superior to the Toyota interface (we cross-shopped multiple Toyota and Lexus models). It comes with a trial subscription to a traffic information service that worked well in Atlanta; no guarantees about rural Saskatchewan. Ditto for the well-thought-out iPod/iPhone interface… which lets you play your tunes, charge your phone, and access other apps, all at the same time. (By comparison, the Toyota iPod interface just freezes the iPhone screen… and scrolling through your playlists requires dozens of pokes at the dashboard touchscreen instead of the Volt’s fluid scrolling with a physical dial.) You can record 30 gigabytes of CD music to the built-in hard disk, which is nice. It even lets you pause live radio (just like TiVo) with a 20-minute buffer. That’s cool. Bluetooth integration with your iPhone is flawless. And, bizarrely, the thing plays DVDs. Only while you’re parked. Apparently, this is a big feature in Japan and Europe (where you can play them while driving). Here in the U.S., I can’t imagine a circumstance where I’d say “Hey! We’re home! Let’s pop in a DVD and watch a movie here in the garage rather than walking fourteen steps to our big-screen TV!” Ah, well, it doesn’t hurt anything. The backseat is… habitable. It’s definitely a four-seater car, because the ginormous battery tunnel runs down the center of the car. No way to put a fifth person in back, even in a child seat. Great cupholders, though. Other nits: No rear-window wiper. Definitely noticeable during pollen season. I assume it was nixed for aerodynamic reasons. There’s a very low air dam in the front bumper which scrapes our driveway. Aerodynamics again. No spare tire (although there’s a sealer/inflation pump). Weight savings. All engineering tradeoffs that I’m sure were vociferously debated in the GM Design Center. I might have made different decisions, but I’m sure these weren’t made casually. The car is too well thought out. Finally, the Volt lease comes with free OnStar… and a nifty iPhone app that lets you remotely monitor the battery, gas tank, tire pressure, and even lock/unlock the doors and honk the horn. Major geek points. Why can’t all cars do this? In general, I don’t like leasing unless you can write it off on your taxes. I don’t even like making car payments. I buy cars for cash. But, with the Volt, things are just too fuzzy. First, the car costs too damned much. Maybe I’m just old-fashioned, but $45,000 for a four-door sedan that doesn’t have a Maserati or Bentley badge just bugs me. From a PR standpoint, the misreporting of the NHTSA tests has been a nightmare. And, politically, the GOP attacks aren’t helping. GM just stopped the production lines for five weeks due to weak demand. (Way to kill off American jobs, guys! Proud of yourselves?) If the worst happens and GM pulls the plug on the Volt, what’s a used one worth in five years? Zero? Technically, no one knows what years of heavy use will do to these lithium-ion batteries. We know they’ll lose capacity; the only question is “How much?” And there is happy handwaving about repurposing used Volt batteries for electric-grid power balancing, but that may or may not happen. So what’s the residual value of a car that’s half battery when the battery is half-depleted? I don’t know. So there are just too many uncertainties for me to write a check for this car. Luckily, GM is way ahead of me, and is offering a heavily-subsidized leasing option. It’s widely advertised as “$2500 down, $350/month.” Of course, that’s for a stripper model without the fancy nav system and backup camera and all the other toys that you really want. And it doesn’t include taxes and all the silly fees that the U.S. dealer network insists on charging. But it’s still a great deal, and I wish more people knew about it. We got a good deal, and we get a warm fuzzy feeling from supporting not only all the assembly line workers, but all the engineers and marketers and corporate managers who have put their butts on the line for this car. I think it’s a major step forward, and I’m proud that Cissa is going to be driving one. I hope you can look past the jokes and consider buying leasing one for your family as well. Thanks for the review. Very helpful. How did you line up the loaner vehicle? One more thing: Neither Chrysler nor Honda has a plug-in car in the market today, nor has either one announced one specific production model to arrive in the next year or two, so technically we don’t know whether they will adopt the J-1772 plug or not. But of course, with Tesla the only company not having done so, one would surmise Honda and Chrysler will go with the majority here. Nice write up, thanks. I’m expecting to get an Ampera later this year, so can appreciate your reaction to the car. However I have to pick you up on “The very best pure-electric cars have only 100-mile range, even under optimum conditions”, as I’m sure you realise the Tesla Roadster can go 245. Their new sedan will do 320 miles. The latter will have a 45 minute fill up. I also ran the numbers for the the US grid average and for Virginia (way above average for coal) and they both come out better than the Prius for CO2. So while the French grid would be desirable, it’s not so bad in the US either. Things will only get better. Great write-up, if a bit Southern boy sarcastic, but as a Bostonian, I can take that. One point about your ‘coal-powered car’ You live in the South, you have a LOT of sunlight available. Maybe not as much as the desert Southwest, due to your wet climate, but there is still a LOT of sunlight, and a LOT of open-flat roofs in the sprawl-lands of the great Southeast. The state govt’s there need to put more regulations on carbon-emitting sources, and start to build up your excellent solar resources there, and then can you start to put a real dent into Carbon emissions from electricity. Yep, I was lazy and didn’t look up the Tesla range. I just remember reading an article about a heroic effort to drive from San Francisco to Yosemite, which required two stops with special arrangements for recharging along the way. Anton, the Tesla Model S does indeed come with a J1772 adapter, standard, no extra cost. Look on http://www.teslamotors.com/models/options and scroll down to “Universal Mobile Connector”. Very much enjoyed this review (and the funny asides)! Awesome! I did those cost-per-mile per calculations a couple of years ago, and yes, it’s insanely cheap per mile. The grams of CO2 emitted per mile is much less because large spinning power turbines burning coal from the Great Satan (Southern Co, right?) are much more efficient than an ICE. And yes, batteries are not yet where they need to be. I contend that once they reach 700 miles of range (about the longest 1-day’s drive imaginable), then they’ll be adopted by all. Right now, if you have to go visit grandma with the whole family, you’ve got to have enough range to go plug-to-plug from sunup to sundown. This will limit adoption to the ‘2nd car’ and not the ‘family car.’ But this will take some time. But I believe we’ll see that kind of range in our lifetime, perhaps within even 10 years. And forget about solar cells doing much good. While at Suniva, I remember calculating a full day’s-worth of sunshine would only add a couple of extra miles…and this assumed cells all over the roof AND hood. I’d love to take you to lunch sometime…just gotta pick me up in your Volt! 1) You can stop the buffeting when the windows are down at speed by cracking one or both of the rear windows 1-3 cm. Don’t leave them closed or fully open. This keeps aero drag down as well. 2) Cracking the driver’s front window and passenger’s rear window provides nice ventalation, and probably uses less energy than the HVAC fan. Great for getting fresh air instead of A/C in mild weather, and for extending your EV range. 3) 240v EVSE is handy when you arrive home late (like 10pm) with an empty battery, and have to leave early the next morning (like 6am). This didn’t allow me the 10 hours needed for a full charge. Also, when arriving home after work, you can add range at 10 mph, extending your range when you go out that evening. A 120v outlet will only add range at 4 mph. I don’t think 700 mi range will be needed for widespread adoption of EVs. With 300 mi range, and 1 hour quick charging, it will be easy to drive 500 mi with a lunch stop, or ever 750 mi with lunch and dinner stops. This will be good enough for almost everyone. The Tesla Model S will be available this year with this capability. However it will take some time for enough 90 kW chargers to be installed before you can be sure to charge at your lunch or dinner stops. “It will take some time” equals “hundreds of billions of dollars.” Level III (“one hour”) chargers require 480V three-phase power, and that doesn’t come cheap. I just had this level of power installed in a laboratory here at Georgia Tech, and it cost $300,000. Yes. Time *and* money. But the process has started. Here is an example: 200 fast chargers (probably 50 kW) will be installed over a four year period. $100 Million pays for them, and wiring for 10,000 level 2 charging stations also. $100M for 200 chargers and wiring for 10,000 outlets? !!! Say the outlets cost $1k a piece (I know I can install one in my house for a 10th that amount but… ) that spends 10M. Now with the remaining 90M I get 200 fast charging stations. That works out to $ 450k each !!. These 1/2 hour chargers, assuming a generous 30% utilization/day have a capacity of 15 cars a day each. Over a 7 year lifetime that is 38,325 charges for $450k or $12/charge (in addition to the electricity cost) to go 40 miles. The aforementioned 36-mpg Chevrolet Cruze will go about 108 miles of $12 of fuel. So it seems to me that California could have found a better use for the funds. Great write up, Stephen. Thanks for sharing. Ga Power is working to get rid of all their coal fired power plants and move to natural gas or better power generation options (see link below). Plant Atkinson, the main coal fired plant servicing Atlanta is nearing completion of its conversion to Natural Gas Power. The new Vogtle addition will help with zero emissions electricity too. Thanks for posting this Stephen. Nearly all car reviews are done by people who test the car free of charge and hand it back after a week or less, so it’s rare and useful to hear from a real owner. It’s a shame the Volt has become a “political football” in the words of the General Motors CEO, because so many will base their opinions of the car not on technical or financial factors but on misinformation from both the Left and Right. Thanks for clouding the issue with facts and reason. Great post, Stephen. As an ex-Prius owner, I can attest to all your points. The Volt is cool. Couple of things about the Prius, I’m surprised you have problems sitting in one, my best friend is 6’4″ and he’s never had the problems you talk about when sitting in my car. Also “A Prius gets all its power from burning gasoline in its own engine” isn’t exactly correct, the Prius also reclaims energy from regenerative braking. We test drove a Volt before I got a new Prius last fall (my second). The Volt, as you mentioned, is $45,000 I got a fully loaded Prius for $26,000. The Volt has NO rear leg room. My 5’3″ fiancee sat in the back and her knees were digging into the back of the seat in front of her. The Volt also has a weird trunk design, there’s a lip on the trunk, preventing you from sliding things in and out and there’s a gap between the rear seats, letting things in the trunk roll into the cabin of the car. The only real annoyance I have with the Prius is the bad iPod control you mention. I’m glad the Volt’s is gooed, but that’s not really worth $20,000 to me. The other strange comparison is that the Prius gets 52 MPG (on average, in warm weather it is better, in cold it is worse. I’m currently getting 58 on this tank) The Volt, when not running on electric, only gets 38. If you rely on the gas engine too much in the Volt, it isn’t any better than any other sedan. But you’re flat wrong about regenerative braking. The Prius DOES get all its power from burning gasoline in its own engine. It’s just more efficient in using it; reclamation of normally-wasted energy through regenerative braking is a big part of that efficiency. But all that power originally came from burning gasoline. The trunk is high. But there’s a nice little cargo bag between the rear seats that prevents apples and oranges from rolling forward. You can just see the top of it in my photo above with the beige seats. Finally, I agree that if you rely too much on the gas engine, the Volt isn’t nearly as attractive. I have a friend who would like to buy one, but he has a 40-mile one-way commute, and no way to charge at the office. The Volt would be a poor choice for him. Since my wife has now burned 0.7 gallons in two weeks of normal driving — over 400 mpg! — I can safely say that her use profile matches the Volt’s capabilities very well. Great write-up, you really covered all the bases and I enjoy your sense of humor. But the real reason I’m actually leaving a comment is: I live in Saskatoon, Saskatchewan (say it 5 times fast, I dare you!) and on weekends I drive for recreation, which means about 80% of the kilometres I put behind me are in rural Saskatchewan. Any chance I can borrow a Volt (yours, or the loaner you used) to try to fill that gap in your dataset regarding the navigation system? Preferably in winter (that gives you lots of time to plan the trip up here) so I can see how much it freaks out when I drive over the frozen surface of Lake Diefenbaker in mid-February – it’s a provincially-maintained Winter Road most years, once the plow has had a chance to go skating. Okay, you definitely started my day off with a smile! And I’d love to see a screen shot of the GPS in the middle of Lake Diefenbaker! But, actually, I enjoyed spending time in Saskatoon during the summer. How on earth did you find this blog post?!? Mike the Mad Biologist linked to this post; he’s a great resource for me when I’m feeling procrastination-y. I’m just finishing teaching a fourth-year class in Environmental Science that included considerable discussion of electricity generation; in Saskatchewan our baseline power is provided by coal, and even though we (as a province) are the world’s largest supplier of uranium, we have no nuclear power generation here. A few of my students have written opinion papers (as an assignment) for the class regarding the future of electricity in Saskatchewan. So, your post’s title is very much in line with topics that have been on my mind lately. I might have a shot of my GPS (a Garmin Nuvi, none of this built-into-new-car business) on either Lake Diefenbaker or one of the ice roads they plow at ferry crossings on the South Saskatchewan River from last year, I’ll have to dig around in my files. For real-world stats on the Volt collected from OnStar, check out http://www.voltstats.net. My Volt is listed there under the name ‘Slipjig’. I bought it in October 2011; so far I’ve got around 3500 miles, run close to 90% on battery, and have filled up the gas tank once (at Christmas). My electric bill is maybe $30/month higher than it used to be, but I was spending $200/month in gas with my previous car. I’ve done extensive TCO analysis (to the point of releasing a phone app for it), and because my driving patterns suit the Volt and I plan to keep it for 10 years, it will end up being very inexpensive in the long run. Stephen, you live in Hotlanta and yet not one mention of Air Conditioning. Does the Volt offer A/C? Is it effective? What happens to the 40 mile range with the A/C on? The Volt absolutely does have air conditioning… two different modes, “ECO” and standard. The “standard” version works very effectively in 80°F heat; haven’t had a chance to try it in 100° temps yet. It does reduce the battery range significantly… maybe a third? Haven’t done any measurements. ECO is less effective, but is perfectly adequate for my wife. A trick that I didn’t notice in the manual, but Micky Bly showed me last week… after double-clicking the remote to unlock all doors, hold the button down and all the windows will go down. A nice way to let some hot air out. And, of course, there’s remote start (REALLY remote, as in anywhere with a cellular signal, if you use the iPhone app!) which lets you start the HVAC before you get to the car. One thing to bear in mind when you evaluate time-of-use rates from your electric company is that in order to get that 1.25 cents per kWh for the energy for your Volt, you have to pay a premium for some of your “other” kilowatt-hours. Time-of-use rate may still be the way to go, but the total impact on your monthly electric bill must be considered, not just the cheap “off-peak” energy that goes into your Volt. Just a follow-up from 12 months and 8000 miles later: Cissa still LOVES her Volt! We’ve bought five tanks of gas in a year, and four of those were for out-of-town trips (Savannah, Huntsville, etc). Only real irritation was cutting a tire sidewall so badly that the inflater/sealer couldn’t deal with it, so we had to call a tow truck. And I still want a sunroof! Otherwise, enthusastically recommended.